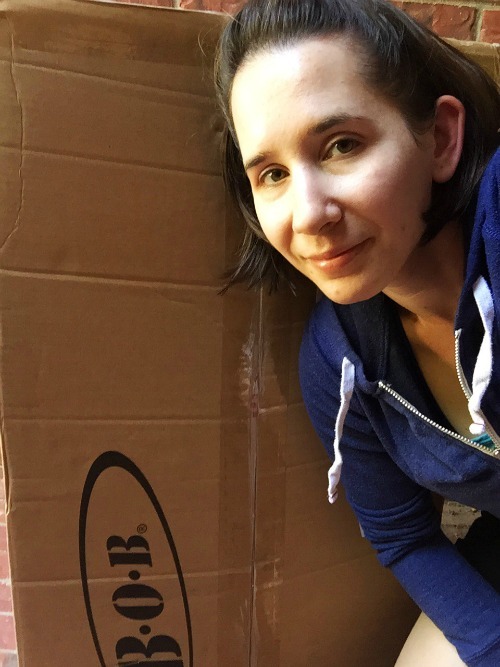 I recently upgraded our stroller and since E and I are both thoroughly obsessed with it, I thought I would share our BOB 2016 Stroller Strides Fitness Stroller review. When E was about 4 months old, I hastily purchased a jogging stroller from a consignment store. The snap-and-go stroller wasn’t cutting it for walks around the neighborhood, but since that was all I saw myself doing with it, I didn’t put too much research into the purchase. Less than a month later, I joined Stroller Strides. We ended up using that pre-owned stroller a lot, and I kinda regretted not buying something a little nicer from the beginning. Fast forward 18 months. When I was attending instructor training in San Antonio, Farel (FIT4MOM’s Global Fitness Director) mentioned a new Stroller Strides BOB was on the horizon– and it had an adjustable handlebar. As a much-shorter-than-average person (I’m 5′), I was instantly sold. I’m not ashamed to say that I became a little bit obsessed with this stroller. I stalked amazon weekly, waiting for it to be released. Comes with a Stroller Strides fitness classes coupon (valid in US only) and a Stroller Strides Fitness Kit by BOB, including a handlebar console, Stroller Strides exercise manual and SPRI® fitness resistance bands. This product comes with a coupon for a free week of Stroller Strides classes by Fit4Mom. Find classes near you at fit4mom.com. Travel system-ready when using the BOB Infant Car Seat Adapter (sold separately). Pair with a BOB B-Safe 35 Infant Car Seat by Britax or with other major brand car seats. Integrated pockets store snacks, drinks, and other necessities. Feature- and spec-wise, the BOB 2016 Stroller Strides Fitness Stroller is the same as the BOB 2016 Revolution Flex. The main difference is that the Stroller Strides edition features the FIT4MOM logo and is only available in blue. The Stroller Strides edition also includes a handlebar console, SPRI fitness bands, a Stroller Strides exercise manual, plus a coupon for a free week of Stroller Strides classes. The bands are a must-have if you want to work out on your own with your baby (I would also suggest a copy of Liza Druxman’s Lean Mommy to supplement the included exercise manual), and nice-to-have if you’re planning to join a Stroller Strides franchise, because bands do wear out, break, and otherwise get lost– you’ll need replacements eventually). 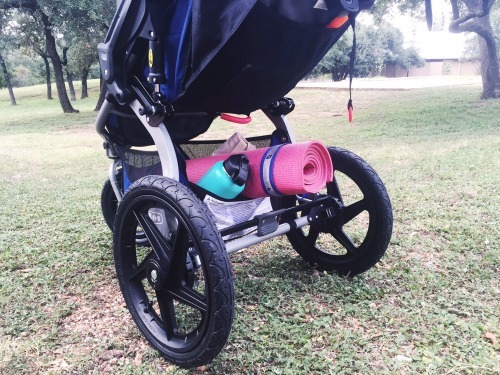 A few weeks into owning the stroller and with several classes under our belt (both with me as an instructor and as a regular ol’ client), I can say with certainty that the BOB 2016 Stroller Strides Fitness Stroller is worth every single penny. 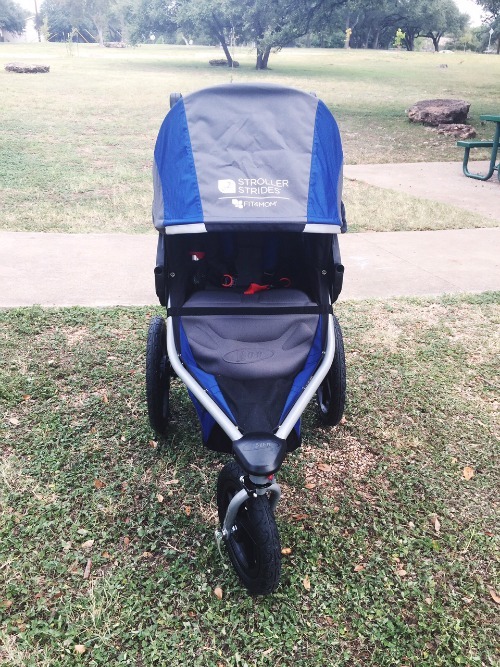 Comparing this stroller to my previous stroller, the tires are larger, so it’s much easier to run with. I love that I can adjust the handlebar to a height that’s comfortable for me. The 5-point harness is far more secure than our old stroller, too, which gives me peace of mind when I’m running with E in the stroller (accidents do happen, which is why it’s so important for kiddos to be properly buckled in during class). The included handlebar console has a zippered compartment and a beverage holder. It is, unfortunately, too small for my 40 oz Hydro Flask, but a standard water bottle would fit just fine. 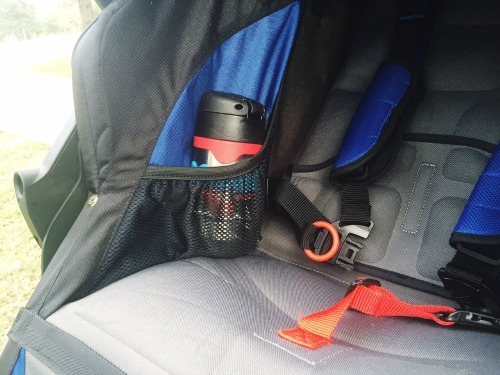 I usually stick my phone in the beverage holder and use the zippered compartment for E’s many snacks (snacks are crucial for getting through a workout with a toddler). The cargo basket is roomy enough to fit my mat, bands, Hydro Flask, and anything else we need for work out. There’s also a pocket on the back of the seat that’s perfect for storing anything you want to get to quickly, plus interior pockets for kiddos to stash toys and snacks. I’m going to assume the padded seat is comfortable because, like I mentioned, E is obsessed with the new stroller. He insists on riding in it when we go check the mail, a journey he’s been walking for since he was 18 months old. The fact that an almost-3-year-old who’d rather be running and jumping is begging to get in a stroller and ride is pretty telling. The sun shade is extra-large and almost completely shades E when he’s sitting in the stroller. This is great from a sun-protection standpoint and also for stroller naps. The seat is super easy to recline, too. All in all, this stroller did not disappoint and was worth the wait. 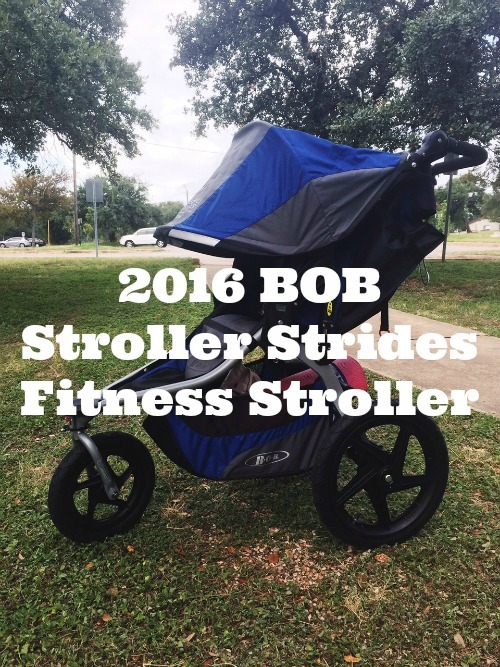 I hope this BOB 2016 Stroller Strides Fitness Stroller review was helpful if you’re in the market for a jogging stroller. It’s a must-have for moms looking to work out with their babies (check out the duallie model if you have 2 kiddos). Check out FIT4MOM to find Stroller Strides classes near you.